ROBERT WATSON from Northumberland, was aged 20, from when he joined HMS Sirius on 20 December 1786 as an able seaman. The next we hear of Robert was in March 1790 when he and his fellow seamen were stranded on Norfolk Island after HMS Sirius was wrecked. 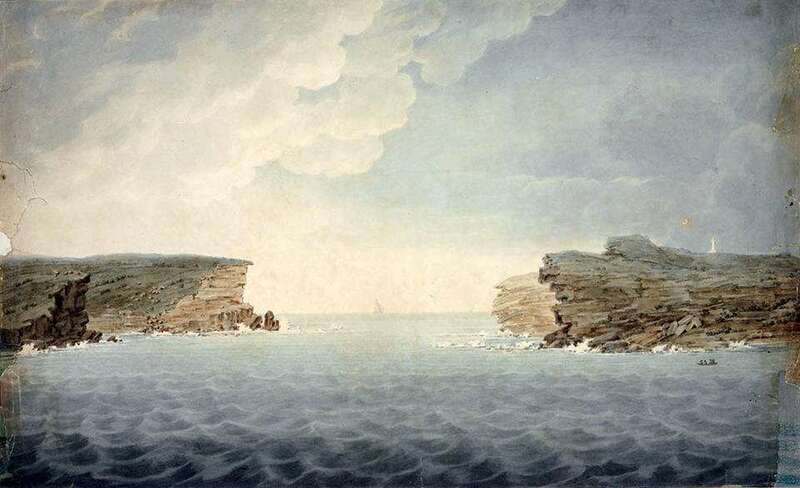 He remained on the Island, returning to Sydney aboard HMS Supply in February 1791, then returning a month later in the March to become settler. He received a 60 acre grant at Cascade Run and was selling provisions to the government. A number of years later he sold the land to George Legg. Robert went as mate on the colonial vessel Francis, remaining on her until she was wrecked in 1805 in Newcastle. He returned to Sydney and served as dockyard boatswain, senior pilot and harbourmaster, and during the evacuation of Norfolk Island early in 1814 he piloted Kangaroo. In 1818, Robert was appointed the first Superintendent and Keeper of the Light of Macquarie Tower at the new South Head Lighthouse Port Jackson, at a salary of £50 per annum. Robert Watson died on 1 November 1819, aged 53, at The Rock Sydney. His death notice was reported in the Hobart Town Gazette and The Sydney Gazette & NSW Advertiser, 6 November 1819. On Monday night (Nov. 1), at his house on the Rocks, Mr Robert Watson, many years Pilot and Harbour Master. NOTICE is hereby give, that John Watson, Heir at Law to the Estate of Mr Robert Watson of Sydney, deceased, intends to apply to the Supreme Court of Civil Judicature, in and for the Territory of New South Wales and its Dependencies that Administration of the Estate and Effects of the said Mr Robert Watson, deceased, may be granted to him. The early history of pilotage in Port Jackson was traced by Captain F.J. Bayldon in an address before the Royal Australian Historical Society last night. The masters who led the First Fleet inside the Heads, said Captain Baydon, it might be claimed, were the first pilots of this port. In 1805 when the Francis was lost in Newcastle, her Captain Robert Watson, formerly quartermaster on the Sirius, was appointed official pilot. Watson’s Bay was named after him. Fixed rates of pilotage were established in 1813. From 1833 all vessels were required to take a licensed pilot aboard before entering the Heads. Various pilots competed for the privilege of boarding. The wrecks pf the Dunbar and the Catherine Adamson in 1857 led to a searching inquiry into the pilot service. Despite recommendations for the use of schooners, it was decided to employ whaleboats. The schooners, however, were built in 1862, but although evolved after a four years’ discussion, were only used for two years. In 1864 the schooners were abandoned and a competitive whaleboat service was substituted. Pilotage rates were £4 a ton, of which the pilot received £2, out of which he had to supply and maintain his boat and crew of four. A disaster in 1867, when the lives of eight men were lost consequent upon the capsizing of serval pilot boats led to the steam vessel Thetis being sent to assist pilot-boats as required. In 1875 the first Captain Cook was built for the pilot service – a wooden steamer. She was under the full control of the Government, and in 1899 came under the control of the Department of Navigation. She was joined by the present Captain Cook in 1893.